You brush and floss every day, but somehow you still get the occasional cavity. What more can you do? Looking online or asking friends, you may come across several home remedies and solutions. One common suggestion is to start chewing gum! But is gum good for your teeth, or is it just another myth? 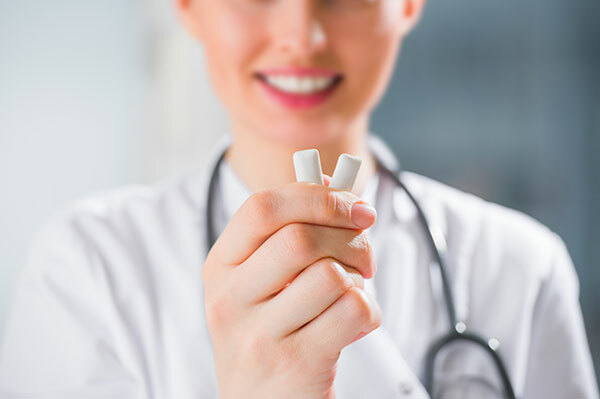 Read on to learn what gum does for your oral health, and the main caveat before you turn to gum as a supplement to your oral care routine. The primary benefit of gum doesn’t have much to do with the gum at all. Unlike brushing your teeth, flossing or using fluoride, chewing gum won’t directly improve your oral health. However, it does one key thing: it generates saliva. Chewing gum stimulates your salivary glands and can lead you to produce up to ten times the amount of saliva than you would without chewing food or gum. In addition to producing more saliva, active salivation has larger quantities of bicarbonate to protect your teeth. How does producing saliva make gum good for your teeth? Saliva is your mouth’s core defense against bacteria, plaque and food particles. Primarily, saliva creates a buffer between your teeth and potentially acidic bacteria. When you eat or drink food, saliva prevents some of it from attaching to your teeth or gums. Saliva, like any liquid, moves around in your mouth. This motion allows it to gently swish even more particles of food, sugar or liquids away from your teeth. At the same time, your saliva functions to dilute and neutralize some of the acids that would otherwise wear away at your tooth enamel. While saliva production is at its peak during eating or chewing gum, it also continues to keep your mouth from drying out between mealtimes. Dry mouth, also known as xerostomia, is a major cause of gum disease and tooth decay – primarily because it indicates a lack of saliva to protect you! You may be wondering if sugary gum is good for your teeth too. Unfortunately for your sweet tooth, it’s not. While any gum will promote saliva production, sugary gum won’t do you any good. Even eating sugary or acidic foods might be less harmful! When you chew gums with sugar, you’re constantly assaulting your teeth with a sticky substance full of bacteria’s favorite substance. While your saliva may wash away much of the sugar, it won’t get it all. Any remaining sugars from your gum will feed bacteria, which leave behind acidic waste. Even worse – chewing gum can push it into hard-to-reach places between your teeth, making it difficult to clean even after you’ve finished chewing! Unlike chocolate treats that introduce sugars to your mouth for a few minutes, people tend to chew gum for a long time. Therefore, your mouth never gets a chance to passively clean away sugars with saliva, as you’re immediately pressing more between your teeth! Numerous studies investigating the oral health benefits of xylitol have shown it to be at least somewhat effective in reducing enamel-damaging bacteria from your mouth. When xylitol is used in gum, it benefits from these direct impacts as well as the secondary benefits of increased salivation. While each study varies in its efficacy, xylitol has been shown to decrease tooth decay rates from anywhere between 30 percent to more than 80 percent. The ADA website has a list of gums that have earned the ADA Seal of Acceptance. While this seal doesn’t necessarily make these gum choices any better than other sugar-free options, it does indicate that the ADA has seen evidence proving that they’re effective at reducing plaque, cavities or enamel-wearing bacteria. While sugar-free and xylitol gums can provide extra defense for your teeth, they are in no way as effective as brushing. No matter how much gum you chew, it can’t stop all bacteria and acids from coming into contact with your teeth. Likewise, flossing is still important. Your saliva can’t dislodge plaque established in those tight spaces between your teeth. Without flossing, you’ll continue to experience tooth pain and other issues associated with cavities and gum disease. Do You Have Dental Health Questions? Schedule an Appointment! We can help make sure you and your family are brushing correctly. If you’re concerned or just looking for information, the professionals at Walbridge Dental provide complete family dental care to families in the Millbury community. Contact us online to set up an appointment now or call us at 419-836-1033. This entry was posted in Dental Tips, Kids Oral Health, Preventative Dental Care and tagged children's dentistry, preventative dental care, Tooth Decay. Bookmark the permalink. Follow any comments here with the RSS feed for this post. Both comments and trackbacks are currently closed.